The name International has become synonymous with tractors, trucks and, of course, the legendary Scout. Finding an International Scout for sale in good condition these days, is becoming more difficult. While the company itself has closed shop, leaving other companies to pick up production of its vehicles, International classics are still very much sought after by collectors and enthusiasts. You can’t deny the impact that International Harvester has had on the automotive industry, the sturdy International trucks or even the International scouts for sale were not the first products turned out by the company. Farming equipment production marked the beginning of the company. International Harvester’s roots are firmly planted in the agriculture industry. A merger between the McCormick Harvesting Machine Company, the Deering Harvester Company and three other small agricultural equipment companies in 1902 birthed the International Harvester Company. In its initial years, International focused its efforts on tractors and other farming equipment, but in 1907 the International Harvester wagon was introduced. With this move toward light trucks, International found itself competing with automotive manufacturers, including giants like Ford and, later, Jeep. May 5, 1975, marked the end of the production of the light truck, but its effect on the company’s history is undeniable. 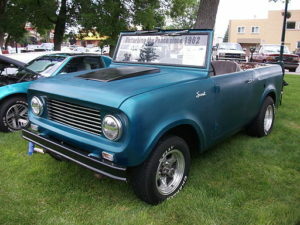 The First International Scout for sale, the Scout 80, entered the picture in 1961. A direct competitor for the Willys Jeep, the Scout was manufactured with many of the same features as the Jeep. Rugged and pared down, the Scout offered an alternative to the Jeep with its boxy body and military styling. This little vehicle underwent a variety of facelifts and modifications as other models were introduced. In 1965, the Scout 800 took the place of the Scout 80, and the 800 continued through 1968. The 800 was designed to offer more creature comforts such as bucket seats, better heating systems and even optional rear seats. The International Scout 800A came onto the scene in 1969, bringing along with it even more creature comforts, including a quieter Dana 20 transfer case, heavier rear axle, and an option for a 304 V-8. In 1971, the 800B came onto the market, but was replaced within the year with the International Scout II. International went on to manufacture several models of International Scout II vehicles and a variety of trucks. Despite increases in sales, it was evident that the company wasn’t generating adequate profit to sustain itself. The company fought valiantly against a struggling economy while facing internal conflicts, but a worker’s strike in 1979 was the last straw, and International found itself in financial crisis. The strike lasted almost six months and cost the company close to $600 million. Adjusted for inflation, that would be the equivalent of a nearly $2 billion loss today. At this point, the company’s fate was inevitable. As 1981 rolled in, it was clear that the company was in serious trouble. In November 1984, International Harvester sold the agriculture division to Tenneco, Inc., signaling the beginning of the end. With the agricultural division, International Harvester sold their name and IH symbol. This would be the last time to see a International Scout for sale directly from the company. The company did retain the Harvester truck and engine divisions, and in 1986 Harvester was reincarnated as Navistar International Corporation. The International brand name lives on today with the manufacture of school buses, engines medium trucks and heavy duty trucks. It will take some patience, but using the tools available online, you will be able to find that perfect International Scout for sale. And so the legend continues. I have been obsessed with the International Scout since I was very young. To locate out further info about the story of this extreme vehicle, as well as to locate an International Scout for sale to add to your collections, be sure to see my blog.